The Filters Fast 2" MERV 11 Air Filters are an economical alternative to genuine OEM air furnace filters of the same size and come in a convenient 6-pack value set. 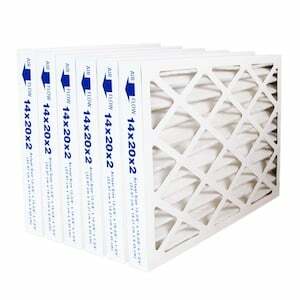 This MERV 11 air furnace filter effectively reduces airborne pollutants such as pollen, pet dander, dust, and mold spores and is made of 100% synthetic gradient media. The media is resistant to a broad range of chemicals that does not absorb moisture or support microbial growth. With a MERV 11 rating, the Filters Fast 2" AC Filter captures particles up to 85%. For greater efficiency, increased allergen reduction and better air flow, upgrade your 2" MERV 8 air filter to this MERV 11 filter. 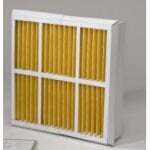 Based on air quality and usage, replace your 2 inch filter every 4 to 6 months for optimum performance. This MERV 11 2" depth filter contains 15 pleats per linear foot. The maximum temperature capacity for this MERV 11 depth filter is 180 degrees Fahrenheit (82 degrees Celsius). 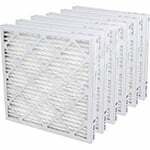 The filter support grid is constructed from a corrosion resistant 30 gauge galvanized expanded metal grid and a frame that is made of moisture proof beverage board. The following chart illustrates the airborne particles you can reduce with a MERV 13 air filter, a MERV 11 air filter, or a MERV 8 air filter.